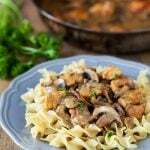 This Chicken Stroganoff has a thick and savory sauce with large chunks of seasoned chicken and tons of earthy mushroom slices. Definitely bursting with flavor! We like to take our time with this Chicken Stroganoff recipe. Allowing the dish to simmer gives the flavors time to soak into the chicken and will make you want to savor every last bite. Make sure to have some bread around to sop up any leftover sauce! Check out this amazing recipe for no yeast breadsticks. They are perfect to sop up the leftover gravy! Season with garlic salt for an amazing pairing! Want to dress it up even more? How about making your own egg noodles? Check out our homemade egg noodle recipe. Also, we love to use our leftovers when we make slow cooker rotisserie chicken in this recipe. 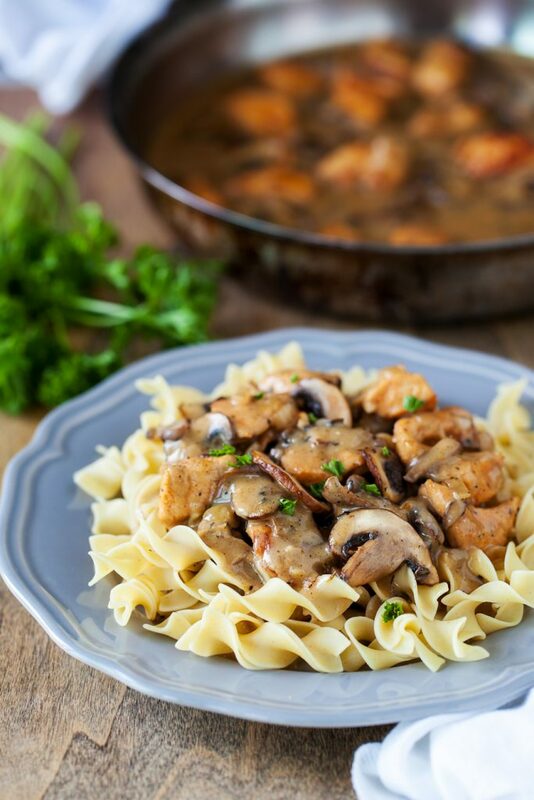 The seasonings from the rotisserie chicken blend great with the gravy in this chicken stroganoff recipe. If you were hoping to make this in the slow cooker you are in luck. You basically just skip cooking the chicken. Follow these directions for Slow Cooker Chicken Stroganoff: In a crockpot, add the chicken, garlic powder, onion powder, paprika, cayenne, salt, and pepper and mix to coat evenly. In a frying pan, heat 2 tablespoons of oil until shimmering. Add the shallot and onion and cook until softened. Next, drop in the garlic and cook until fragrant, which will take about 30 seconds. Add the mushrooms and cook until browned. Pour in the wine and cook until the wine has reduced by half, scraping any brown crust from the bottom of the pan. Stir in the butter until melted. Add the flour and stir until no lumps remain. Add this mixture to the crockpot, along with the chicken broth, Worcestershire sauce, sour cream, and thyme. Cook on low for 4 hours. The great debate, noodles or rice. We serve it over egg noodles, homemade or store-bought, but it’s just as delicious over rice. We recommend using Jasmine, but any variety of long grain rice will work. Looking for other dinner recipes? In a medium bowl, mix together the chicken, garlic powder, onion powder, paprika, cayenne pepper, salt and pepper. Set aside. In a large skillet, over medium heat, heat 2 tablespoons of oil until shimmering. Cook the chicken just until the outside is browned (you will finish cooking it later), working in batches if necessary. Transfer to a clean plate. To the now empty skillet, heat the remaining 2 tablespoons of oil until shimmering. Add the shallot and onion and cook until softened. Add the garlic and cook until fragrant, about a minute. Add the mushrooms and cook until browned. Pour in the wine and cook until the wine has reduced by half, scraping any brown crust from the bottom of the pan (deglazing). Stir in the butter until melted. Add the flour and stir until no lumps remain. Pour in the chicken broth, followed by the Worcestershire sauce, and thyme. Add the chicken along with any juices. Bring to a boil. Reduce the heat and let simmer until thickened. Stir in the sour cream until incorporated and creamy. Serve hot over cooked egg noodles and garnish with fresh parsley. Did you make Chicken Stroganoff? What could be substituted for the wine? I don’t use it. I didn’t use the wine when I cooked it and it came out just as good! Nice to know I don’t need the white wine, thanks. Would this serve 6 adults for a supper meal? What would you pair with it? If you don’t want to use wine, but want the tang that wine provides and the tenderizing that occurs when meat cooks in wine, you can usually substitute white grape juice for white wine, and cranberry juice for red wine. Only if you want the sauce sweet. This recipe (chicken stroganoff) isn’t really intended to be sweet. Chicken stock. Can you use the crock pot to cook everything, except the noodles? Crock pot WILL NOT saute, so nothing will turn that nice brown color. You can use an Instant Pot if you have one. Chicken broth can be subbed in any recipe if you don’t care for wine. Also plain Greek yogurt in place of sour cream. In most cooked recipes try not to use “fat free” sour cream or yogurt. Your sauce will be very thin and watery. Texture is lost. Save the day free stuff for chilled dressings and dips! I find that fat free sour cream stands up better in cooking, and that regular sour cream gets watery is it’s heated the least bit. White vinegar is a good substitute. All the alcohol in wine cooks out so why an objection.? Not all of the alcohol cooks out. Some folks don’t like to open a whole bottle of wine for a small recipe. Perhaps they’re not big wine drinkers, either. I like wine occasionally, but I don’t drink a whole lot, so if I used wine for cooking, it would have to be when I’m in the mood for it to drink it, have multiple recipes I’m preparing that calls for wine, or there’s somebody else there that can help drink the leftover wine. I used red wine vinegar and it came out delicious! That looks amazing! I have a question about the blue pan used in the video. What brand is it? I am in search of a good pan that will go from stove top to oven. Any suggestions? Exactly or All Clad is a really good alternative or Lacruset but they are expensive. LeCruset ! 6-7 qt. Dutch oven is my “go to” for soups, stews, chuck roast, low and slow cooking. (Braising) THE best!!!!!!! Yummmmm. Hit a TJ Maxx, Marshall or Home Goods. If you don’t mind it being a one off of the rest of your cookware… they have amazing prices on high end pieces. I never went wrong buying a piece made in Italy or Germany. The dutch ovens are so heavy with out food in them. Would like your chicken stroganoff recipe. Looks delicious! 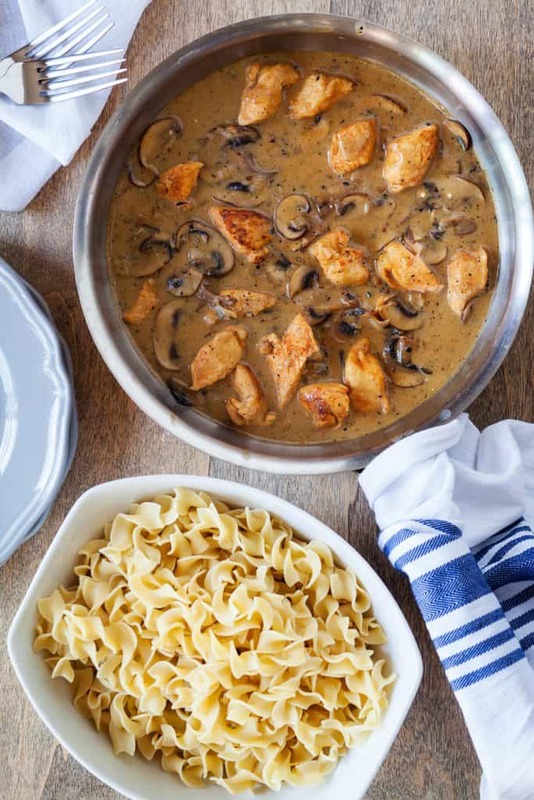 I will have to try and make this chicken stroganoff! Thanks for sharing. How many does this recipe for stroganoff serve? This recipe is FAULTY!! THere is no instruction as to what to do with the mixed spices!! Does anyone proofread these recipes??? In the first step you mix the chicken with the spices. Good thing you were up late to help old Harlan proof read the recipe! My dumb question is what’s the best way to print these recipes other than paper and pencil. I’ve been sending recipes to myself in Messenger. Now all of my fav recipes are in one place! the spices are mixed with the chicken….chicken is the first thing it says before the spices. Actually, it does say. Right under the cook and prep times. Serves 4. It says serves 4 right at the top. 1 pound of chicken can serve 4 people when it’s accompanied with egg noodles or rice. If in doubt, add 1/2 lb of chicken to the recipe. You don’t have to increase anything else. That will do for four servings with extra! I can’t use Worcestershire Sauce. Is there anything I can use to substitute? The alcohol evaporates, if that’s why you don’t want to use it. I love this recipe as is but I need to substitute the mushrooms sadly. What do you recommend? What would be better ! Cooking white wine or drinking white wine? Sorry. I could not resist ???? Never cook with a wine that you wouldn’t drink. Try a nice Chardonnay… gives a beautiful flavor! Hi: I have always heard that drinking wine is always the best way to go. The Food Network Chefs always say.. “Never put in your recipe any wine ( or alcohol ) that you would not drink. 🙂 I hope this helps. As I don’t drink, I always by the smaller bottles of wine that come in four. I boil the wine before I introduce it into a sauce. Good Luck!!! Can the sour cream be substituted with non-dairy, plain yogurt? I have some severely lactose intolerant folks in my house. Yes, that would also work! They do make a lactose free sour cream. its a little pricey but your tummy will thank you. What non dairy substitute can be used instead of the sour cream? This looks so good, and probably a good recipe to adapt for instant pot cooking. Have you tried this with chicken thighs? I like them so much better than breast meat, which tends to dry out easily. I imagine one would only have to cook thighs a bit longer. Thank you for sharing this! This recipe sounds delicious! What type of white wine would be best for cooking? I only drink Moscato, but think it might be too sweet for recipes. Any white would work, but you are right, a Moscato would probably sweeten it too much. I use a dry white like a sherry. A friend of ours posted this on FB yesterday and we went straight to the grocery store and bought the ingredients. We have a ‘date night’ dinner once every 2 weeks since our 4 boys moved out and always try something new. No point just watching all those cooking shows. This is hand’s down in our top 5 list. This was a perfect meal. The flavours were so good and intense. Is there a substitute for one of the canned soups. So much sodium and I lcan’t do that. Thanks. It does not say amount of pasta?? Anyone know if I cook the whole bag?? Really? As much as you would normally eat! This looks delicious and I am going to try it right away. Thanks for posting this. I love the White Wine touch. My Mother always cooked with White Wine and everything she did turned out to be fabulous. She was a Cook for a lot of Families and the alcohol always cooks off– you will never even know you used it. Two Tablespoons is not enough to even get excited about. If it were a half of a bottle or something, that might be different. Two Tablespoons of white wine just gives it a flavor. I am certainly going to use the White Wine. Thanks for posting this. I have run off the recipe and will use it probably more than once. Tried this recipe today. Didn’t use the wine and used Greek yogurt instead of the sour cream. Very tasty, we all enjoyed it. Thanks so much. Hi! Is it a must to use flour, if I want to go as low carb as possible, any substitute or can I just leave the flour out? Thanks! made this for my husband and i…what a lovely dish we both enjoyed it! I made this tonight. It was delish! I followed the recipe and found it to be a great keeper! Next time I will add more wine, cause we really love the taste of wine sauces. But it is excellent just as it is written. Thank you for this new variation for chicken! Hi!Wine is not allowed here in saudi arabia, what can I use as an alternative? Pls, help me, tnx! Happy cooking! God bless! You could just use chicken broth or stock. I did this recipe today. My first stroganoff. It was amazingly delicious and easy to make. Thank you for such an outstanding recipe!! This recipe is SO good! I love the kick from the cayenne. I wanted to drink the leftover sauce too. The only thing I changed was leaving out the shallot – I had one leftover from a previous recipe but it wasn’t good anymore. Will try to include shallot next time o make it but didn’t miss that at all! Oh and I also used smoked paprika because I was out of regular paprika. Again, it tuned out so we’ll! It’s my first time making a recipe from your blog and will not be my last! Thank you! This looks wonderful. I can hardly wait to try it. I actually plan to try it in my Instant Pot! I found the pepper over powering! I knew adding it in it seemed like a bit much but I like to give a recipe a try first as is, I would half the black pepper otherwise it was a hit! I need to know the amount of Sodium in all recipes I use, I’m on a 1500mg of sodium a day. It is hard to adjust if you don’t know the amount in a serving. What are the nutritional valves? GREAT RECIPE WILL TRY THIS SOON THANKS. I’m making this tonight. Any time I have a recipe that calla for Thyme or Rosemary, my husband always comments that there’s some taste in the dish he doesn’t like and he wont finish it. Is the thyme an important ingredient to stroganoff, or do you think I can leave it out? Made it according to recipe. Turned out real good. I made this today – only substitution was using GF flour. It was very tasty, and will definitely make again. Thanks!! Tried this recipe today and it was delicious! The only major alteration was the addition of baby bella mushrooms. I had white buttons in the refrigerator so I used them. Next time I will definitely use bellas. i’m considering adding some chopped, toasted brazil nuts – if I can find them. I saw only one comment that noted the strong black pepper flavor. You really have to enjoy pepper to add a full teaspoon. Fortunately we do. If I make this for guests I will use half that amount. Don’t want to lose all the flavor. You don’t use a crock pot. You won’t get the carmelizing in a crock. Use a heavy PSN like a Dutch oven or cast iron. I wanted to make it, but nowhere to be found on this page (and I’ve been scrolling back and forth for 30 minutes): no recipe, no list of ingredients, no directions. I’m using PC and googlechrome…and I get pretty webpage pix, LOTS of ads, mention of crockpot and the comments. Where’s the actual recipe? Shouldn’t that be top, front, center? I’m sorry. The recipe is there now… there was a glitch in our system. Was a great recipe! I made it at lunch time for dinner tonite! Great taste! Can’t wait!!! Great receipe, can I make this with turkey instead of chicken? Wow. I’m floored. This was f***ing delicious! I did not use any sour cream; it thickened plenty without it, and the creaminess was there. I used crimini mushrooms instead of bella; margarine instead of butter, no pasta, and i most definitely used white wine. A couple of tablespoons isn’t even worth the worry some people are talking about. I have already made plans to make this again, served hot in bowls with spoons, no pasta, maybe a couple slices of baguette. Delicious! I tried this and it was delicious! Left out the cayenne pepper, used cooking sherry instead of white wine and Better Than Bullion Chicken with water instead of chicken stock (due to allergies and what I had on hand). I served it over jasmine rice. Next time I will do it with the noodles or some kind of pasta and take a picture. Look forward to making it again. Thank you! Absolutely amazing!! Everyone loved it!! Kids & all ( who don’t like mushrooms). Will definitely be making this again! Liked it with the chicken better than beef. Everyone liked the bite from the cayenne pepper. Very easy and very good ! My husband was very suprised that using chicken instead of beef taste so good ! Made it all ready two times !!! Really Susan more pepper?! Are you crazy? Just made it today. Very tasty with a mild warmth from the pepper. The chicken was tender. I didn’t have fresh thyme but used dried and still tasted great. Definitely will make again.